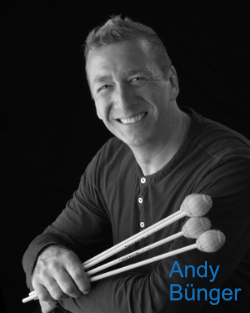 My name is Andy Bünger and I am from a family with a long history in the entertainment industry, from the age of four I have been performing in front of every kind of audience. I have always had a thirst to educate myself in every aspect of music, along the way I learned to play several different types of instrument which led me to the Akademie für Tonkunst in Darmstadt, Germany where I studied classical drums, mallets and percussion and I didn’t stop there. I received tuition from Stefan Traub (Mike Oldfield, Gary Burton) in jazz vibraphone, I also focussed on composition and arrangements before continuing my studies with Armin Keil this time I chose Latin piano. In the 1980’s I opened my own studio - Skymark Productions - where I compose & record soundtracks, commercials and even radio jingles. Today I am a qualified audio and mastering engineer, a certificate I earned at the Hofa Studios GmbH this time in Karlsdorf, Germany. My skills don’t just exist within the studio. I am a very experienced Musical Director & Production manager ideally suite to the cruise lines and live corporate events.